As the name suggests, this is the music that plays when you visit the "Sales and Factories" screen in the car company management game, Detroit. 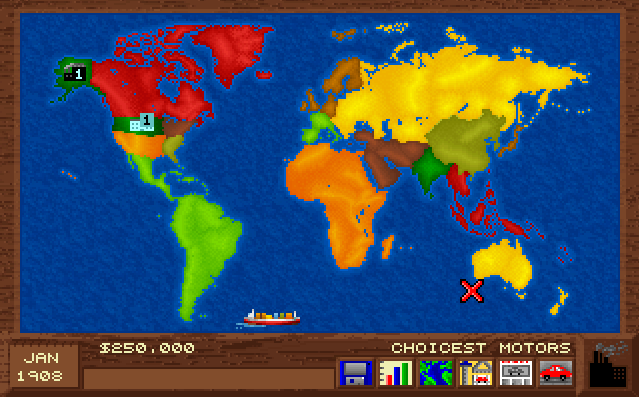 From this screen you're able to build new factories and showrooms across the globe and you can choose from 16 territories: Canada, N.W. United States, N.E. United States, S.W. United States, S.E. United States, South America, Northern Europe, Southern Europe, Eastern Europe, Mid East, India, China, Japan, South East Asia, Africa and Australia. Japan, China, India and Canada are the only territories that represent a single country instead of multiple countries (Australia is almost in that category too except I notice that New Zealand is included as well). The United States is represented by four territories each representing a different region of the country. I guess if I wanted to live up to the game's namesake I should've built my first factory in North-East United States... oh well. The music is very cruisey, which evokes images of holidays to faraway places - so perfect travel agent music right? Or something you'd hear in a hotel elevator?